Take it to the street. 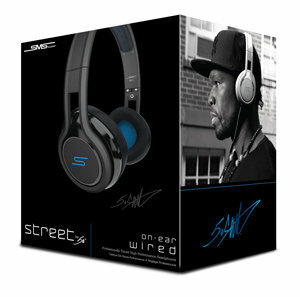 Bring your music with you in luxurious style with the Limited Edition STREET by 50 On-Ear Colour Headphones. Take your music on the go with the foldable, compact STREET by 50 On-ear Headphones. Detachable cord (with three-click microphone) for tangle-free street-wear and transport, plus enhanced bass and ultra plush memory foam ear pads. Listen comfortably for hours and when you're done, fold them up and protect them in the included hard shell carry case. These headphones also feature our On-Ear OVALFIT cushions for extra comfort. The custom 40mm driver with professionally tuned sound signature gives you studio quality sound for demanding audio applications. The sound signature of STREET by 50 has been professionally engineered to deliver a more pure, uncolored, and balanced sound to ensure you hear your music as the artist originally intended, no matter the genre-from rap to rock, jazz to classical. The tough, tangle-free cord is detachable for easy storage and transport, with a built-in mic for taking calls, so you can switch between your phone contacts and your tunes. With Professional studio quality sound, high-end styling, enhanced bass and soft memory foam cushions the STREET by 50 wired headphones will ensure a comfortable ride no matter where your music takes you. The STREET by 50 headphones are ready to go wherever you are, each STREET by 50 on-ear headphone includes: removable cable with mic, carry case, airplane plug adaptor, and soft touch cleaning cloth, owner’s manual, and product brochure. It's a versatile audio solution to enjoy your favorite music anywhere and everywhere. 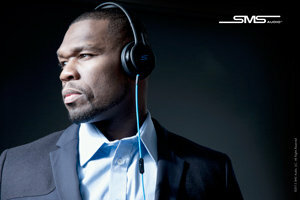 More than simply headphones, SMS Audio allows you to experience the power of music on your own terms. Smart, stylish and comfortable, these devices provide you with an escape into the lush world of professionally-tuned, acoustically perfect music...anywhere, anytime, and any way you want to hear it. SMS Audio was developed by international recording artist, actor, and philanthropist Curtis "50 Cent" Jackson as the next step in the evolution of personal audio technology. A first-class audio headphone and accessories brand, SMS Audio, LLC is dedicated to improving the way people experience music. SMS Audio combines technology, function and style to bring the highest calibre of sound, comfort and fashion to every product.